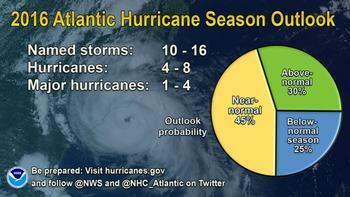 The Atlantic hurricane forecast for this year ranges from normal to slighty above normal. Colorado State University is calling for 15 storms, three more than average, while the National Oceanic and Atmospheric Administration (NOAA) is calling for 10 to 16, within the normal range. But even "normal" hurricanes cause severe property damage and loss of life, with winds often exceeding 111 miles per hour in major storms. "We anticipate a near-average probability for major hurricanes making landfall along the United States coastline and in the Caribbean," CSU professor Philip J. Klotzbach said, noting that statistics don't matter if you're sitting in the path of a storm. "As is the case with all hurricane seasons, coastal residents are reminded that it only takes one hurricane making landfall to make it an active season for them. They should prepare the same for every season, regardless of how much activity is predicted," Klotzbach said. There are more than 6.6 million homes in vulnerable areas along the Atlantic and Gulf Coasts, with an estimated reconstruction cost of $1.5 trillion, according to the Insurance Information Institute in New York. CSU is predicting that six of the storms will grow into full-fledged hurricanes while two will become major storms capable of causing devastating damage. La Nina, a cooling of the Pacific, is expected later this year, making it easier for storms to form in the Atlantic. Atlantic storms are among the most powerful on earth and, besides their toll on human life, cause billions of dollars in property damage, driving up insurance rates and upsetting energy and agriculture markets. The Gulf of Mexico, a hurricane-prone zone, processes more than half of the nation's gasoline and a big chunk of it natural gas and crude oil. Florida, also a storm target, is the world's second-largest producer of orange juice.